Scleral buckling (SB), introduced more than six decades ago, is still being successfully employed for the repair of primary uncomplicated RD., Although primary pars plana vitrectomy (PPV) has been increasingly used in the management of rhegmatogenous RD, SB continues to hold its ground and despite the many obituaries, is still a procedure that enjoys patronage with a dwindling tribe of retinal surgeons. To those who practice the art of buckling, following application of a small plomb over a peripheral retinal tear, the manner in which a bullous RD, the height of which remained unchanged at the end of surgery, flattens out the next morning is nothing short of fascinating. When used to treat uncomplicated RD, literature search of peer-reviewed publications show that there is not much to choose between SB and PPV with respect to anatomic and visual outcomes. Both retrospective studies and prospective randomized data have not been very conclusive in this regard., Regarding cost to the patient, SB is significantly cheaper when compared to internal procedures in an eye with a clear lens. The surgeon's perspective of the clinical situation in a particular case, his comfort, confidence, and expertise with SB or PPV are important factors which decide which procedure the patient's eye will eventually be subjected to. Herein lies the advantage that PPV has gained. With the use of wide-angle viewing systems (WAVS) - both contact and noncontact - the surgeon's view is easily available to a learner on an adjacent microscope or on a digital platform. In contrast, since indirect ophthalmoscopy is used during SB, the surgeon's view is not routinely available on another platform for the benefit of a trainee in the operating room. When compared to PPV, this shortcoming has perhaps led to lesser dissemination of the buckling procedures to fellows in training and by extension, an underutilization of this efficient technique. Although it is not necessarily more efficacious than SB, PPV is the more commonly employed procedure for repair of primary RD., The use of PPV in managing RD has increased over the last two decades due to technological advances in vitrectomy machines (pumps, cutting probes, vacuum control, and adjustable duty cycles), introduction of noncontact WAVS (NC-WAVS), and surgical adjuvants, such as triamcinolone, vital dyes, endolaser probes, and perfluorocarbon liquids. 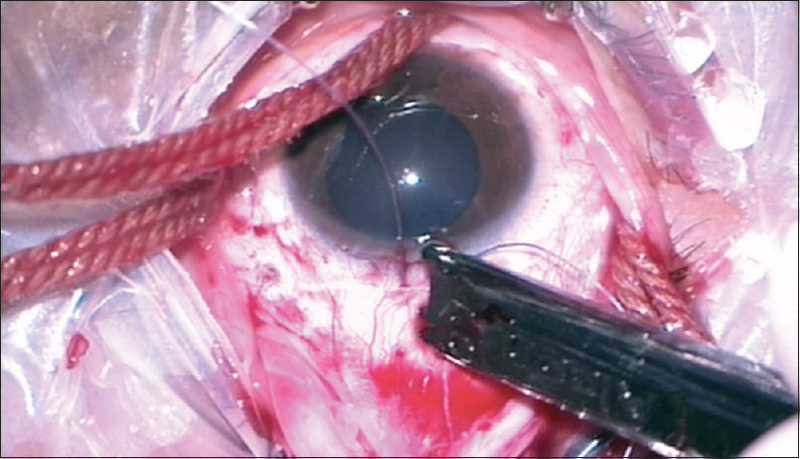 When performing an internal procedure for RD, removal of the entire vitreous is essential. In normal course, this necessitates an induction of a posterior vitreous detachment (PVD), if such a detachment is not present preoperatively. Thereafter, extension of the PVD as far out to the periphery as possible in all quadrants ensures that there is no vitreous frill left on the retinal surface. Extension of the PVD to the periphery is also essential to remove vitreous from around the retinal breaks. When the vitreous is very adherent, the process of PVD induction may lead to additional breaks. PVD induction is also challenging in eyes with retinal dialysis. In a phakic eye, vitreous is inevitably left behind at the vitreous base despite best efforts since the vitrectome may not reach the recess between the posterior surface of the lens and the peripheral retina without contact with the posterior capsule of the lens. This difficulty in reaching the vitreous base with the vitrectome is more pronounced in children where the volume of the lens is high relative to the volume of the vitreous. Consequently, surgeons prefer placing a SB when phakic eyes or retinal dialysis are encountered. Remnant vitreous, either on the retinal surface or around the retinal breaks, acts as a scaffold for glial proliferation. The mechanical effects of proliferative vitreoretinopathy are thus exacerbated. Eventually, reopening of a break that was flattened on the operating table may occur. 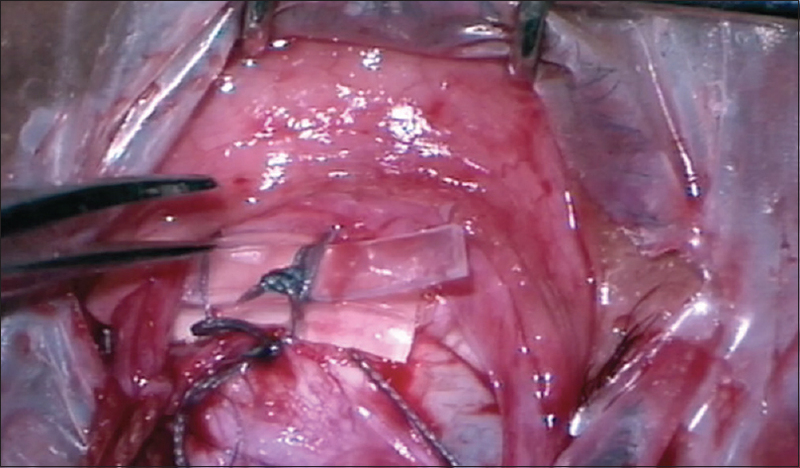 Incomplete removal of the vitreous leads to smaller and inadequate tamponade, and this is potentially dangerous when inferior breaks are being dealt with. 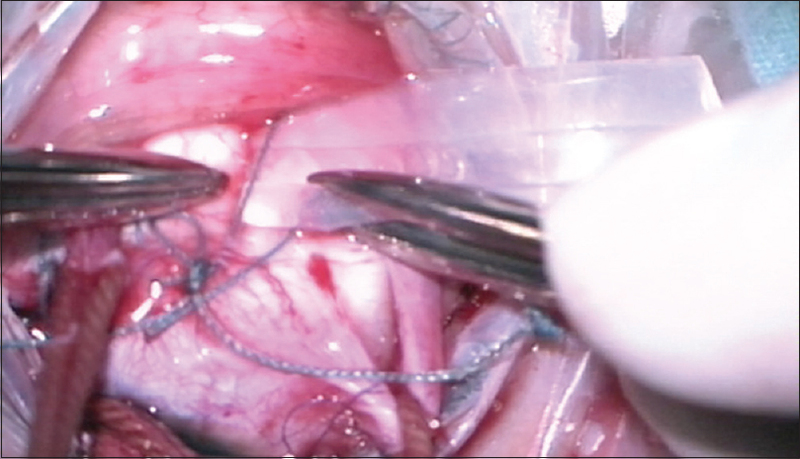 In sum, it is apparent that, when performing a PPV for RD, the surgical goal would be to remove the vitreous entirely. This event can be considered the cornerstone for long-term surgical success. Therefore, when this important step cannot be accomplished fully, the surgeon tends to avoid entering the vitreous cavity and attempts to approximate the retinal break and the retinal pigment epithelium (RPE) whilst remaining outside the globe. The sclera is the tough outer coat of the eyeball, which derives its name from the Greek word sklera. The verb buckle traces its origin to the French boucler, which means “to bulge.” Whereas, indirect manipulation of the retina utilizing the differential buoyancy, specific gravity, and interfacial tension of five different fluids (balanced salt solution, perfluorocarbon liquid, silicone oil, perfluorinated short-chain carbon gases and air) is utilized during PPV to achieve retinal reattachment, SB employs a more direct approach to tackle the pathology. 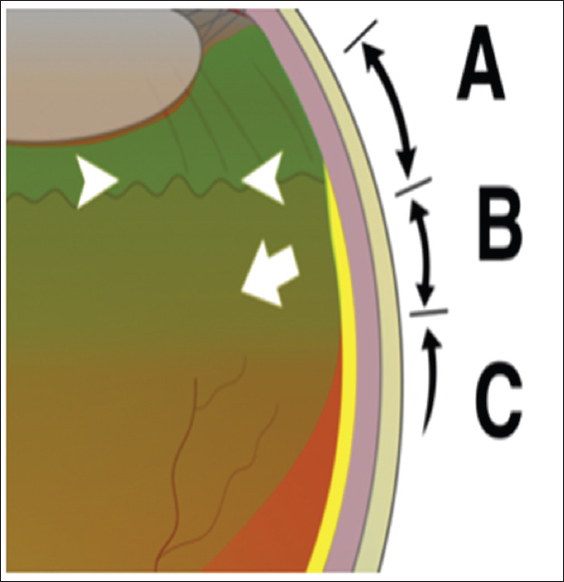 Physical approximation of the RPE and retina is achieved by indenting the sclera externally using a solid (tires, strips and bands) or porous (sponges) silicone material [Figure 1] and [Figure 2]. Performing cryopexy around the site of retinal breaks ensures maintenance of this attachment. Forces that lead to formation of retinal breaks and eventual RD are vitreous traction and fluid currents caused by rotary eye movements. On the other hand, the active RPE pump, a centrifugally acting hydrostatic pressure from the vitreous, the oncotic pressure gradient between the choroid and subretinal space, and the viscous mucopolysaccharide substance between the RPE and the photoreceptors promote retinal adhesion. Besides closing the underlying retinal break, local indentation provided by the buckle relieves centripetal vitreoretinal traction [arrow, [Figure 3]. By shortening the diameter and circumference of the vitreous base, encircling elements of the buckle reduce transvitreal traction [arrowhead, [Figure 3]. Moreover, encircling elements support the vitreous base [zone A, [Figure 3] and prevent development of new breaks along the region of peripheral vitreous attachment just posterior to the vitreous base [zone B, [Figure 3]. In the presence of epiretinal membranes (ERM), there are additional radial forces directed inward toward the vitreous that promote detachment of the retina. 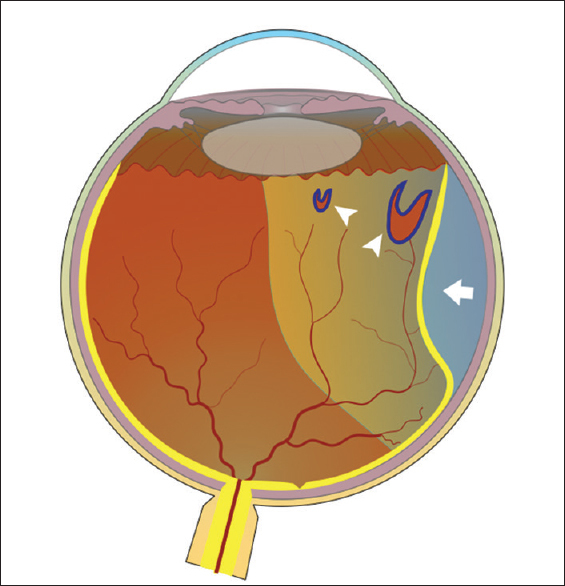 When a SB is placed externally, the concave inner retinal surface is indented and becomes convex. Thereafter, the radial force exerted by the ERM, which was hitherto acting in an inward direction begins to act in an outward direction. This aids retinal attachment. Along with changes to the tractional forces, scleral buckles disrupt the pattern of fluid flow through the retinal break. The indent caused by the buckle brings the RPE closer to the retina. First, this displaces the existing subretinal fluid (SRF) away from the site of break. Second, since the potential space immediately behind the break is reduced, fluid from the vitreous does not find easy passage into the subretinal space. Third, not unlike a piece of iron and a magnet, the force driving the retinal break toward the RPE is inversely proportional to the distance between them, and therefore, the retina and RPE are driven closer to each other in the presence of a buckle. Fourth, the indent provided by a buckle tends to push the fluid vitreous away from the break. This leads to plugging of the break by solid vitreous gel and the effect can be reinforced with the use of perfluoropropane (0.3 mL of 100% C3F8). Indeed, after relief of these tractional forces and disruption of intraocular fluid currents with scleral buckles, Figueroa et al. 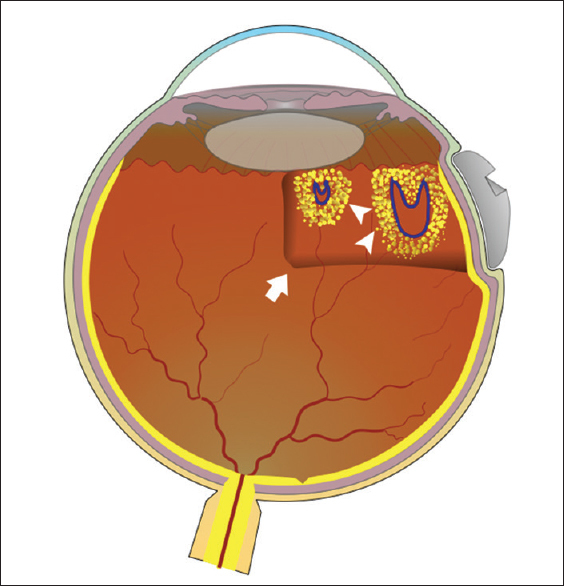 found that retinal reattachment could be achieved and maintained without the use of retinopexy. The efficacy of SB decreases when the view of the retinal periphery is compromised., Clear viewing of the periphery with the indirect ophthalmoscope (IDO) is thus a prerequisite when SB is being planned. Pseudophakic eyes with posterior capsular opacities, eyes with small pupils, or eyes with peripheral lenticular changes do not offer the best possible view when the IDO is used. Moreover, with the IDO, the image obtained is small and inverted. 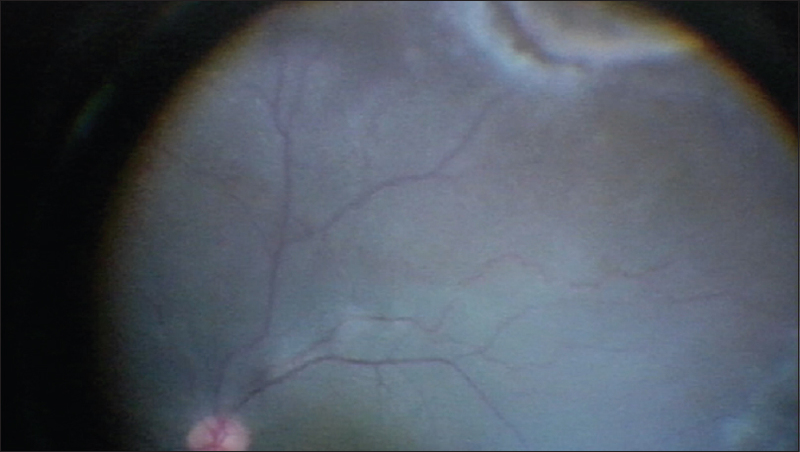 Herein lies the advantage of using a surgical microscope as the viewing system and an endoilluminator to provide illumination when performing SB., In contrast to the coaxial illumination provided by the IDO, the use of an endoilluminator or Chandelier light source during SB provides oblique illumination, and this improves the identification of peripheral retinal breaks. One of the important advantages that the surgeon enjoys with WAVS and Chandelier SB (CSB) is that needle drainage of SRF can proceed in a controlled stable manner under direct visualization and the chances of losing view of the needle are minimized. Besides its ability to provide stable images even in small pupils and in eyes with lenticular opacities, WAVS provides the surgeon the ability to adjust magnification, transmit the view of the surgical field digitally and facilitates recording. These advantages offered by endoilluminator-assisted SB with WAVS provide scope in dissemination of knowledge and in surgical training. Indeed, young surgeons in training find the view of the periphery better and are able to complete the surgery without missing any retinal breaks as the experienced surgeon standing by can guide the entire procedure. During SB, excessive cryotherapy is usually done by trainees in fear of missing out a retinal break while viewing with the IDO. This can definitely be reduced with CSB. Improved surgical success thus achieved invariably increases the confidence of the surgeon in performing the procedure on another occasion. In their cohort of patients with RD, Aras et al. described the simultaneous use of a NC-WAVS and 25G light fiber illumination. 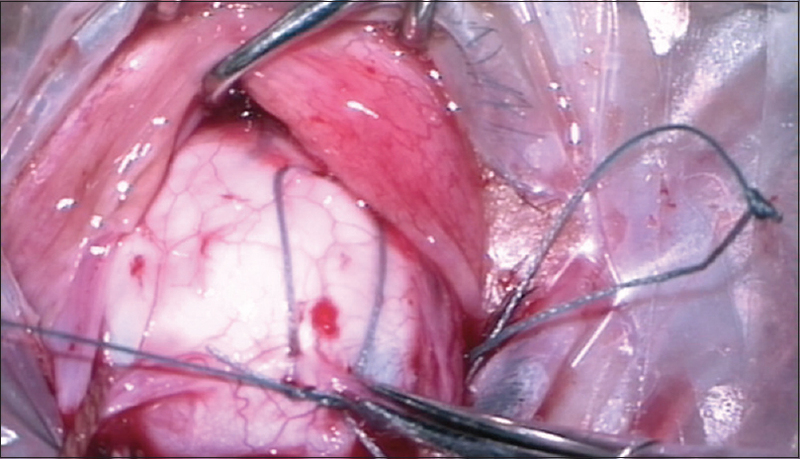 For the first time, this brought the advantages of microsurgery and IDO into SB surgery. They performed a sclerotomy with a 27G needle 3.5 mm behind the limbus at the 6 or 12 o clock position. A 25G uncannulated Torpedo light (Alcon Labs, Fort Worth, TX) was inserted through this sclerotomy. This arrangement provided good illumination of the posterior segment and thereafter, the retina was viewed with the help of an NC-WAVS (BIOM; Oculus, Germany). Improving on this technique, Kita et al. used as traditional 25G fiberoptic chandelier light source through a standard transscleral cannula (Alcon, Fort Worth, TX, USA) and an NC-WAVS (Resight, Carl Zeiss Meditec AG, Jena, Germany) to perform SB surgery. In this report, it is emphasized that, apart from its utility for eyes where the retinal break is visible, CSB is a versatile tool even for eyes where the retinal break is not made out preoperatively. Yokoyama et al., improved on this technique of using NC-WAVS for SB by employing twin un-cannulated 27G chandeliers (Eckard TwinLight Chandelier; DORC International, Zuidland, the Netherlands) for illumination in children with RD. During SB, after performing cryopexy under direct visualization using an IDO, Haug et al. using the chandelier illumination and NC-WAVS for performing needle-assisted drainage of the subretinal fluid. Li et al. compared the results of standard SB with WAVS- assisted SB and determined that reattachment rates were comparable in the two groups (92.38% in standard SB and 94.27% with the use of WAVS). Few surgeons are comfortable with the use of contact-WAVS (C-WAVS) for retinal surgery. The utility of CSB is no less impressive when C-WAVS is used., Since the introduction of WAVS into SB surgery, the method of SRF drainage has also been modified to incorporate direct visualization of the needle. In another report, the chandelier port was used to inject balanced salt solution to drive out the SRF. The duration of surgery with the CSB is shorter than with traditional SB. The time and effort needed for the surgeon to move the microscope away from the field, get up from the chair, use an IDO, get back to the chair, and readjust the operating microscope are eliminated. In fact, it has been shown that VR surgeons are prone to suffer from neck strain due to frequent use of the IDO. Problems are compounded in no small measure when a presbyopic surgeon with pain in the neck, instruments in both hands and a foot on the pedal for cryotherapy has to move around in a dark VR operating room with a bemused fellow, amused anesthesiologist, and an exhausted assistant. It is all too apparent the entire surgery can proceed in a smooth uninterrupted fashion when CSB is performed with WAVS. Under local or general anesthesia, a 360° peritomy is performed and all four recti are identified and looped. With the use of an IDO, breaks are identified and marked externally. Drainage of SRF is performed if necessary. Cryopexy is then accomplished. The cryopexy probe doubles up as the instrument for indentation of the globe while the globe is rotated to the desired position and stabilized using the sutures looping the recti. The length of the explant is decided based on the lateral extent of the retinal tears and the breadth is decided based on the anteroposterior extent of the tears. Polyester sutures are placed in a horizontal mattress fashion and they pass through partial thickness of the sclera [Figure 4]. Care is taken to avoid perforating the globe or avulsing the vortex veins that usually lie in the vicinity of the posterior limb of the anchoring suture. Perhaps, this step of placing the anchoring sutures in the relatively posterior aspect of the globe where there is limited room for movement, visualization is difficult, and the sclera is thin is the most challenging one to master for the young surgeon. Sutureless buckling is an advancement in this domain where the desired height if indentation is achieved by the overriding encircling element. Once the sutures are placed, the buckle element is introduced and tightened [Figure 5]. Care should be taken to keep a check on the intraocular pressure (IOP) and paracentesis can be performed to decrease the IOP. Examining the retina with an IDO ensures the position of the buckle and adequacy of the indent height. Adjustments can be made if required. An encircling 240 number silicone band is then usually placed [Figure 6]. While closing the 360° peritomy, it is prudent to close the Tenon's layer separately as this prevents buckle exposure. When performing a CSB, after peritomy and muscle isolation, a trocar-cannula is placed in the quadrant opposite to the one with the break [Figure 7] and [Figure 8]. However, we avoid placing the trocar directly opposite the break and instead place it one to two clock hours away from the opposite meridian. For example, when dealing with a break at 6 o' clock, the trocar for the chandelier could be placed at 1–2 or 10–11 o' clock positions to reduce chances of lens touch and to improve oblique visualization over the quadrant where cryopexy is to be performed. Using the second hand to gently tilt the light source alters the obliqueness of illumination. When combined with gentle movements of the hand performing scleral depression, these changes in angle of illumination of the peripheral retina enable visualization of the contour of the retinal surface. Irregularities or disruptions of the smooth surface can thus be identified [Figure 9]. Looking for fine retinal flaps and opercula in the vitreous overlying the suspicious area can also identify breaks. The shadows cast on the adjacent retina by these opacities move with movement of the light source and are useful to pick up tiny flaps located close to the ora serrata. Once the retinal break is identified, cryopexy is performed under direct visualization either with the C-WAVS or NC-WAVS [Figure 10]. Thereafter, the light source is removed from the eye. In case a trocar cannula system is being used, the cannula can be plugged temporarily. Removal of the light source is essential at this stage, as the globe now needs to be rotated by the assistant to provide access to the sclera behind the muscle insertions to enable affixation of the horizontal anchoring mattress sutures for the SB. Retaining the light source during globe manipulation could lead to inadvertent lens touch or spontaneous extrusion of the cannula with simultaneous vitreous incarceration. After placing the SB, its position over the retinal break and adequacy of indent height can be rechecked by introducing the Chandelier light source and viewing through the microscope [Figure 11]. Paracentesis is done to reduce the IOP after tightening the SB. This prevents vitreous incarceration when the chandelier is removed. Preplacement of a 7-0-polygalactin suture in a shoelace pattern around the cannula and tightening it as the cannula is being removed also aids in preventing vitreous incarceration. In the event that vitreous incarceration occurs, a scissor can be used to trim the vitreous. Where Does Pars Plana Vitrectomy Score over Scleral Buckling? Extensive tissue trauma, surgical handling, and delayed recovery after undergoing SB are often cited as reasons for moving over to PPV. Instruments available with small gauge vitrectomy permit the surgeon to confidently work close to the retina and in the absence of a PVD, allow for shaving of vitreous from the retinal surface. Moreover, sutureless small gauge PPV ensures a comfortable post operative period for the patient. With PPV, the retina is more often completely attached at the conclusion of surgery owing to internal drainage of the SRF. On the other hand, after buckling, there may be persistent SRF. If this SRF is thick and viscous, delayed absorption is the norm, and it is accompanied by suboptimal visual recovery. Continuous clear intraoperative viewing with WAVS, the ability to locate breaks that were not visualized preoperatively (especially in pseudophakic eyes), the possibility of using a drainage retinotomy for internal drainage (when the causative break is not identified intra-operatively) and the easier option of a 360° endolaser (which seals any undetected breaks) have also contributed to the popularity of PPV. Surgeons resort to PPV in eyes with breaks in >2 quadrants or with posterior breaks, for eyes where the PVD is present or easily inducible (beyond the first two decades of life) and in eyes where lens damage is not a concern (aphakes and pseudophakes) while using the vitrectome anteriorly during base shaving with scleral indentation. Most importantly, complicated RDs are best managed with PPV. Apart from the inadvertent events that are encountered with the standard SB procedure such as globe perforation while placing the anchoring sutures, refractive change, intrusion or extrusion, infection, globe ischemia, and choroidal detachments, CSB presents a few unique risks. A vitreous wick at the site of the Chandelier could lead to the potentially devastating complication of endophthalmitis. Mechanical damage to the lens or peripheral retina and light-induced retinal toxicity can also occur. New retinal breaks can occur intraoperatively as the light source is being removed. Even today, SB has a lot to offer for the patient and the surgeon. With avoidance of changes to the intraocular milieu, SB remains an effective method to approximate the retina and RPE in uncomplicated RDs. Besides achieving the primary goal of retinal reattachment, enhanced surgeon's comfort is a definite benefit while employing endoilluminator or Chandelier-assisted SB. Feasibility of training surgeons in the operating room remains the biggest advantage offered by endoilluminator-assisted SB. As clinicians in this era of microincision surgeries, it behooves us to ensure that this science and art is not lost to the future generations of surgeons and patients who might benefit from the oldest, yet extremely versatile technique to attach the detached retina. Steel D. Retinal detachment. BMJ Clin Evid 2014;2014. pii: 0710. Hilton GF, Das T, Majji AB, Jalali S. Pneumatic retinopexy: Principles and practice. Indian J Ophthalmol 1996;44:131-43. Custodis E. Treatment of retinal detachment by circumscribed diathermal coagulation and by scleral depression in the area of tear caused by imbedding of a plastic implant. Klin Monbl Augenheilkd Augenarztl Fortbild 1956;129:476-95. Schepens CL, Okamura ID, Brockhurst RJ. The scleral buckling procedures. I. Surgical techniques and management. AMA Arch Ophthalmol 1957;58:797-811. McLeod D. Is it time to call time on the scleral buckle? Br J Ophthalmol 2004;88:1357-9. Schwartz SG, Flynn HW. Primary retinal detachment: Scleral buckle or pars plana vitrectomy? Curr Opin Ophthalmol 2006;17:245-50. Brazitikos PD, Androudi S, Christen WG, Stangos NT. Primary pars plana vitrectomy versus scleral buckle surgery for the treatment of pseudophakic retinal detachment: A randomized clinical trial. Retina 2005;25:957-64. Heimann H, Hellmich M, Bornfeld N, Bartz-Schmidt KU, Hilgers RD, Foerster MH, et al. Scleral buckling versus primary vitrectomy in rhegmatogenous retinal detachment (SPR study): Design issues and implications. SPR study report no 1. Graefes Arch Clin Exp Ophthalmol 2001;239:567-74. Seider MI, Naseri A, Stewart JM. Cost comparison of scleral buckle versus vitrectomy for rhegmatogenous retinal detachment repair. Am J Ophthalmol 2013;156:661-6. Kita M, Fujii Y, Kawagoe N, Hama S. Scleral buckling with a noncontact wide-angle viewing system in the management of retinal detachment with undetected retinal break: A case report. Clin Ophthalmol 2013;7:587-9. Li XJ, Yang XP, Lyu XB. Comparison of scleral buckling using wide-angle viewing systems and indirect ophthalmoscope for rhegmatogenous retinal detachment. Int J Ophthalmol 2016;9:1310-4. Schwartz SG, Flynn HW Jr., Mieler WF. Update on retinal detachment surgery. Curr Opin Ophthalmol 2013;24:255-61. Hwang JC. Regional practice patterns for retinal detachment repair in the United States. Am J Ophthalmol 2012;153:1125-8. Velez-Montoya R, Jacobo-Oceguera P, Flores-Preciado J, Dalma-Weiszhausz J, Guerrero-Naranjo J, Salcedo-Villanueva G, et al. Primary repair of moderate severity rhegmatogenous retinal detachment: A critical decision-making algorithm. Med Hypothesis Discov Innov Ophthalmol 2016;5:18-31. Adelman RA, Parnes AJ, Ducournau D; European Vitreo-Retinal Society (EVRS) Retinal Detachment Study Group. Strategy for the management of uncomplicated retinal detachments: The European Vitreo-Retinal Society Retinal Detachment study report 1. Ophthalmology 2013;120:1804-8. Heimann H, Zou X, Jandeck C, Kellner U, Bechrakis NE, Kreusel KM, et al. Primary vitrectomy for rhegmatogenous retinal detachment: An analysis of 512 cases. Graefes Arch Clin Exp Ophthalmol 2006;244:69-78. Shanmugam PM, Singh TP, Ramanjulu R, Rodrigues G, Reddy S. Sutureless scleral buckle in the management of rhegmatogenous retinal detachment. Indian J Ophthalmol 2015;63:645-8. Jin H, Zhang Q, Zhao P. Minimal in situ conjunctival incision for segmental scleral buckling surgery. Ophthalmic Surg Lasers Imaging Retina 2014;45:574-6. Thompson JT. The biomechanics of scleral buckles in the treatment of retinal detachment. In: Ryan's Retina. 6th ed., Vol. 3. Amsterdam, Netherlands: Elsevier; 2018. p. 1875-88. Figueroa MS, Corte MD, Sbordone S, Romano A, Alvarez MT, Villalba SJ, et al. Scleral buckling technique without retinopexy for treatment of rhegmatogeneous: A pilot study. Retina 2002;22:288-93. Aras C, Ucar D, Koytak A, Yetik H. Scleral buckling with a non-contact wide-angle viewing system. Ophthalmologica 2012;227:107-10. Seider MI, Nomides RE, Hahn P, Mruthyunjaya P, Mahmoud TH. Scleral buckling with chandelier illumination. J Ophthalmic Vis Res 2016;11:304-9. Shiba H, Shiba T, Kodaka R, Kamizuru M, Shiba K. Retinal reattachment surgery using wide-angle viewing systems and chandelier illumination. Folia Jpn Ophthalmol Clin 2010;23:301-4. Narayanan R, Tyagi M, Hussein A, Chhablani J, Apte RS. 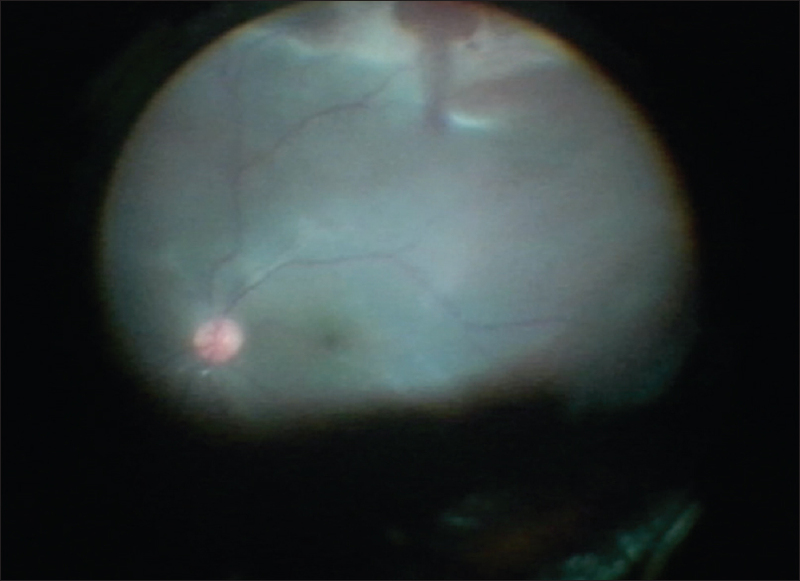 Scleral buckling with wide-angled endoillumination as a surgical educational tool. Retina 2016;36:830-3. Yokoyama T, Kanbayashi K, Yamaguchi T. Scleral buckling procedure with chandelier illumination for pediatric rhegmatogenous retinal detachment. Clin Ophthalmol 2015;9:169-73. Haug SJ, Jumper JM, Johnson RN, McDonald HR, Fu AD. Chandelier-assisted external subretinal fluid drainage in primary scleral buckling for treatment of rhegmatogenous retinal detachment. Retina 2016;36:203-5. Nam KY, Kim WJ, Jo YJ, Kim JY. Scleral buckling technique using a 25-gauge chandelier endoilluminator. Retina 2013;33:880-2. Nagpal M, Bhardwaj S, Mehrotra N. Scleral buckling for rhegmatogenous retinal detachment using vitrectomy-based visualization systems and chandelier illumination. Asia Pac J Ophthalmol (Phila) 2013;2:165-8. Chhablani J, Balakrishnan D. Chandelier-assisted external drainage of subretinal fluid. Retin Cases Brief Rep 2015;9:223-5. Al-Abdullah AA. 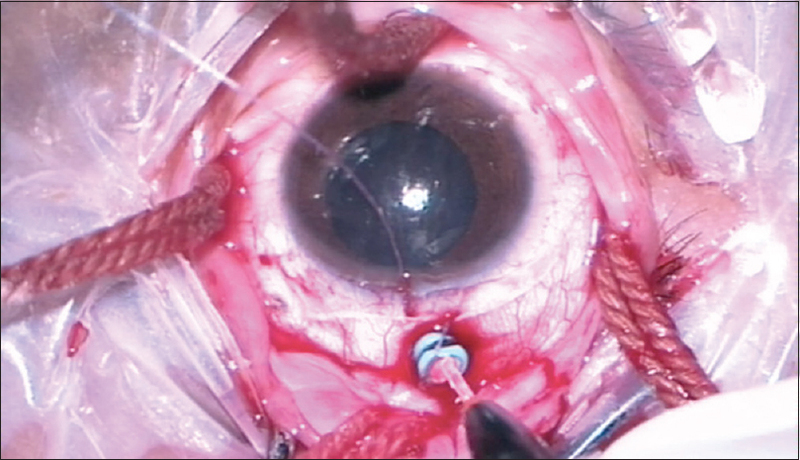 Novel technique for subretinal fluid drainage with chandelier-assisted scleral buckle surgery: Cannula-controlled drainage. Retin Cases Brief Rep 2017;13. doi: 10.1097/ICB.0000000000000533..
Mehta S, Hubbard GB 3rd. Avoiding neck strain in vitreoretinal surgery: An ergonomic approach to indirect ophthalmoscopy and laser photocoagulation. Retina 2013;33:439-41. Papakostas TD, Vavvas D. Postoperative complications of scleral buckling. Semin Ophthalmol 2018;33:70-4. 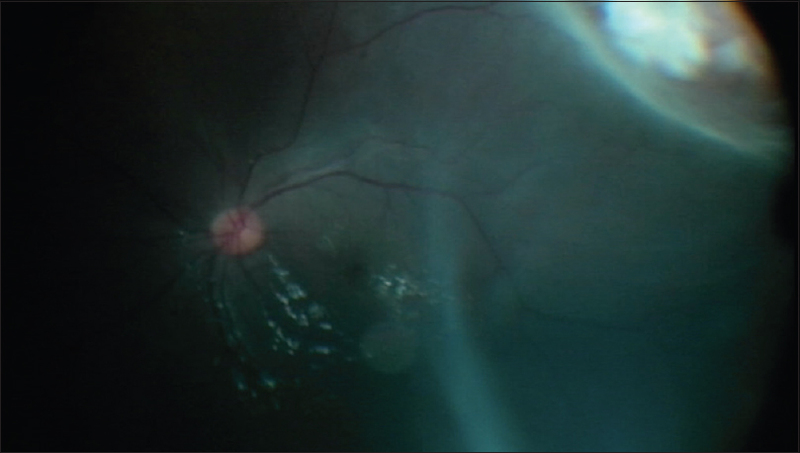 Sakono T, Otsuka H, Shiihara H, Yoshihara N, Sakamoto T. Acute bacterial endophthalmitis after scleral buckling surgery with chandelier endoillumination. Am J Ophthalmol Case Rep 2017;8:7-10. Imai H, Tagami M, Azumi A. Scleral buckling for primary rhegmatogenous retinal detachment using noncontact wide-angle viewing system with a cannula-based 25 G chandelier endoilluminator. Clin Ophthalmol 2015;9:2103-7.